The filmmakers' second short film, ''The First Easter Bunny,'' won the audience award at the F4 Film Festival in Fitchburg on April 12. Inspiration for the 14-minute comedy came when Grant (above, at right), who hails from Leominster, first noticed signs around Fitchburg touting the city as ''Home of the First Easter Bunny.'' Smith, who lives in Fitchburg, says he found the claim puzzling. 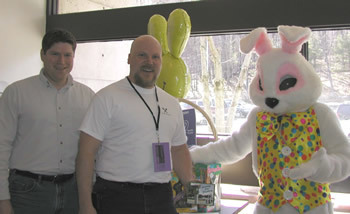 ''As far as we knew, the Easter Bunny didn't have a home,'' says Smith, who met Grant three years ago during their day jobs at Cisco Systems in Boxboro. The film was an ideal follow-up to the pair's first short, ''We've Got Johnny,'' a satire about Leominster native son Johnny Appleseed. ''The First Easter Bunny,'' written by Smith and Grant (above, left to right), stars Smith as Jack LeBlanc, a Fitchburg-based ''jack of all trades'' who narrates ''the inspiring true story of Fitchburg's favorite rodent son to a group of children on Easter Sunday,'' notes Smith. The filmmakers are now entering their short film in other festivals. This story ran on page N14 of the Boston Globe on 4/20/2003.